The need to protect sensitive electronic components and computer boards from electrostatic discharge during handling, shipping, and assembly provided the driving force for development of an entire new class of antistatic packaging materials. Key developments in polymers -- notably conductive polyethylene and sophisticated laminates with very thin metallized films -- have created a multi-million dollar packaging industry. This enterprise undoubtedly saves many hundreds of millions of dollars each year for the electronics and computer industries, and it dwarfs all other commercial and industrial antistatic abatement activity. This page describes a simple demonstration of the shielding effect provided by the antistatic bags used to store and ship electronic components and assembled boards. Click here if you wish to review another demonstration of the phenomenon of electrostatic shielding. The apparatus required for the demonstration includes a TESV that is, the tonal electrostatic voltmeter, preferably mounted on a tripod, various antistatic bags large enough to cover the instrument, plus a plastic tube or rod and a rubbing cloth. PVC pipe, Teflon, or Nylon work well with cloths of wool or silk. The demonstration is conducted by setting up the TESV instrument on the tripod, turning on and zeroing the instrument, and then bringing the plastic rod, charged up by rubbing, close to the sensing head. As expected, the instrument responds by indicating the presence of charge. The TESV is then covered by one of the antistatic plastic bags and the experiment repeated. Refer to the photograph shown above. Now, the instrument registers little or no charge. Even when a charged conducting object is discharged directly to the bag, the instrument registers little or nothing. The explanation of this phenomenon is that the instrument has been shielded from the electrostatic field of the charged object by the conductive bag. Note that it is not necessary to ground the bag. If grounding were necessary, antistatic bags would be much less convenient and effective than they are. Grounding is unnecessary here because electric charge abhors the inside surface of any void enclosed by conductive material. For an ungrounded bag, the charge simply stays on the outside where it harmlessly remains. Now consider the problem of removing a sensitive electronic component or board from a charged bag. If the bag is handled by a person, contact with the hand serves to ground the bag and remove the charge. However, if the person wears insulating gloves, then the component may draw a strong electrical spark as it is withdrawn from the bag and may be damaged. Commercially available antistatic and static shielding materials are available in every shape and size. In addition to thickness, abrasion resistance, and so forth, the technical specifications usually refer to either MIL specs or some measure of the rate of charge dissipation. Definitions for antistatic materials abound and sometimes can be confusing. For a summary of these, please click here. Refer to the advertisement shown just below. 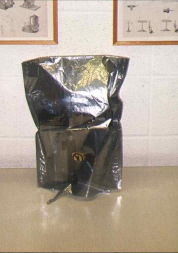 This bag has a metallic layer which provides "Faraday Cage" shielding, in reference to the above cited fact that charge abhors the inside surface of a conductor (as long as there is no charge within the bag). A somewhat different type of bag is described in the advertisement below. This bag has no metal layer, but instead is made from a conductive polyethylene film. Note the claim that this bag will dissipate 5000 volts in 2 seconds. This claim is made in reference to a standardized test where the bag is charged up to a preset voltage, the source is disconnected and the voltage is monitored with the bag connected to ground. In fact it is electric charge that is dissipated; however, the voltage, being far easier to measure and also being directly proportional to the charge for a fixed capacitance geometry, provides a convenient, indirect measure of the rate of charge dissipation. For a set of photographs showing a very impressive demonstration of shielding, where a Faraday cage is used to protect a person from the deadly electrostatic spark of the very large van de Graaff generator at the Museum of Science in Boston, please CLICK HERE. H.A. Haus and J.R. Melcher, Electromagnetic fields and energy," (Prentice-Hall, Englewood Cliffs, NJ), 1989, pp. 27-28.